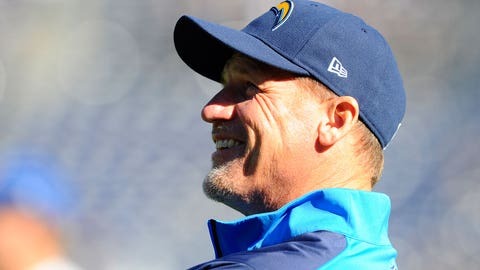 Whisenhunt is now the San Diego Chargers' offensive coordinator and is getting some credit for the comeback season by quarterback Philip Rivers. With talent such as Calvin Johnson, Matthew Stafford, Reggie Bush, Ndamukong Suh and Nick Fairley, the Detroit Lions should have one of the more attractive job openings for a head coach this off-season. 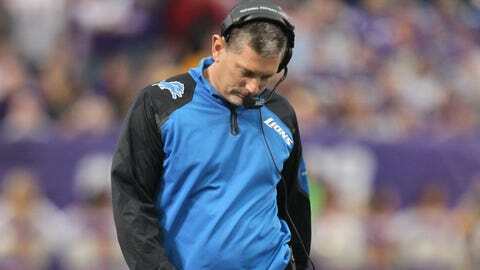 Jim Schwartz could not survive Black Monday as the Detroit Lions' coach. KEN WHISENHUNT: Led the Arizona Cardinals to the Super Bowl five seasons ago, but he then got fired a few years later after the team regressed. Whisenhunt is known for helping to develop quarterback Ben Roethlisberger when he was offensive coordinator for the Pittsburgh Steelers. He’s now the San Diego Chargers’ offensive coordinator and is getting some credit for the comeback season by quarterback Philip Rivers. That experience coaching quarterbacks would be valuable in Detroit to help Stafford rebound from a mistake-prone finish this season and to take the next step in his career. JACK DEL RIO: A former NFL player and head coach of the Jacksonville Jaguars, Del Rio is currently Denver’s defensive coordinator. He filled in for Broncos coach John Fox earlier this season when Fox underwent heart surgery. LOVIE SMITH: Chicago Bears’ fans couldn’t wait to get rid of him even though he posted an 81-63 record from 2004-12. He was fired after winning 10 games last year and failing to make the playoffs because of a tiebreaker. Smith, who has a reputation for being a solid defensive coach, sat out the 2013 season. JOSH MCDANIELS: A former Michigan State graduate assistant under Nick Saban in 1999-2000, McDaniels became a NFL head coach at age 33. He got fired by Denver during his second year and finished with an overall record of 11-17. He’s now New England’s offensive coordinator. JON GRUDEN: It seems like the longer he stays in broadcasting, the greater his reputation as a coach becomes. No job opens up these days without someone mentioning his name for it. The question is whether he wants to get back into coaching or remain as a broadcaster for ESPN. He’s another quarterback guru who could be good for Stafford. GARY KUBIAK: Fired by the Houston Texans this season when things totally fell apart, but he led that franchise to the postseason for the first time and won a playoff game each of the last two years. HUE JACKSON: He’s only a running backs coach right now for the Cincinnati Bengals, but he previously was the Oakland Raiders’ head coach, getting fired after an 8-8 season in 2011. BRIAN KELLY: The Notre Dame coach considered leaving for the NFL a year ago when he flirted with the Philadelphia Eagles. Kelly is known as a creative offensive mind. His resume includes coaching at Grand Valley State and Central Michigan. BILL O’BRIEN: It might be too late because O’Brien has been widely speculated as the frontrunner for the Houston Texans’ job. O’Brien was the offensive coordinator and play-caller for the New England Patriots before replacing Joe Paterno as Penn State’s coach. O’Brien worked through the Jerry Sandusky controversy and NCAA sanctions that he inherited, to go 15-9 in his first two years with the Nittany Lions. His contract includes a clause that would cost a team more than $6 million to get him out of his Penn State contract. DAVID SHAW: Kept the Stanford program rolling after taking over for Jim Harbaugh. Shaw has nine years of experience as a NFL assistant. He recently signed a long-term extension to stay at Stanford, but he’s still considered a hot commodity for the NFL. Whether this is the right time to make the move is the question. JAY GRUDEN: Jon’s brother is considered one of the game’s better offensive coaches. He’s currently the coordinator at Cincinnati and has interviewed for some NFL head-coaching jobs in recent years. He will get his break one of these years. PETER CARMICHAEL: New Orleans’ offensive coordinator, Carmichael is viewed as Saints coach Sean Payton’s right-hand man. TODD BOWLES: Defensive coordinator for the surprising Arizona Cardinals, Bowles was believed to be a finalist for the Lions’ head-coaching job five years ago. RAY HORTON: The former Lions’ assistant coach is currently the defensive coordinator of the Cleveland Browns. GREG ROMAN: The San Francisco 49ers’ offensive coordinator has a reputation as one of the NFL’s top coaches on the rise. ADAM GASE: He’s considered a very good offensive coordinator for the Denver Broncos although Peyton Manning certainly helps make him look even better. DARRELL BEVELL: Offensive coordinator for the Seattle Seahawks, he’s helped develop standout quarterback Russell Wilson, a largely-overlooked third-round draft pick in 2012. DAN QUINN: In his first season as the Seahawks’ defensive coordinator. MIKE PETTINE: Another of the up-and-coming coordinators around the league, Pettine is in charge of Buffalo’s much-improved defense.